1 Bedroom + Convertible bed(s), 2 Baths, (Sleeps 4). 900 square feet. This property is located in a rural setting surrounded by spectacular mountain scenery, waterfalls, and beautiful tropical gardens. Cuesta de Piedra is a quiet pueblo where our electric bill is hand delivered to our gate. International bird watching tours set up on the road to view the many birds found on and around our property. One of our recent guests spotted 87 species of birds just on our property (see complete list below). We are within easy walking distance of the Macho de Monte canyon and the drives to La Amistad and Volcan Baru National Parks is less than an hour. Our guest suite is private, secure, and well appointed. Enter on the second level into a large living/dining/kitchen area. This level features a full self-catering kitchen, a full bath room, dining for four with a day bed that converts to a king or two twin beds, as well as a full size washer and dryer.. Also on this level is a private balcony that overlooks Volcan Baru. The private balcony looks out onto a river valley headed by Volcan Baru, a beautiful 11,000+ foot tall volcano and the highest point in Panama. There is a custom built spiral stair that takes you down to a bedroom with queen bed, full bath room, and a private deck. There is a gated entry and covered parking for one vehicle. Bird List: Cattle Egret, Black Vulture, Turkey Vulture, Roadside Hawk, Yellow-headed Caracara, Peregrine Falcon, Spotted Sandpiper, Pale-vented Pigeon, Scaled Pigeon, Ruddy Ground-Dove, White-tipped Dove, Sulphur-winged Parakeet, Barred Parakeet, Orange-chinned Parakeet, Blue-headed Parrot, White-crowned Parrot, Squirrel Cuckoo, White-collared Swift, Vaux's Swift, White-necked Jacobin, Snowy-bellied Hummingbird, Rufous-tailed Hummingbird, Blue-crowned Motmot, Fiery-billed Aracari, Olivaceous Piculet, Red-crowned Woodpecker, Golden-olive Woodpecker, Lineated Woodpecker, Slaty Spinetail, Streak-headed Woodcreeper, Greenish Elaenia, Yellow-bellied Elaenia, Slaty-capped Flycatcher, Paltry Tyrannulet, Common Tody-Flycatcher, Bran-colored Flycatcher, Black Phoebe, Dusky-capped Flycatcher, Panama Flycatcher, Great Kiskadee, Boat-billed Flycatcher, Social Flycatcher, Piratic Flycatcher, Tropical Kingbird, Fork-tailed Flycatcher, White-winged Becard, Masked Tityra,Yellow-winged Vireo, Philadelphia Vireo, Blue-and-white Swallow, Northern Rough-winged Swallow, House Wren, Orange-billed Nightingale-Thrush, Clay-colored Thrush, White-throated Thrush, Tennessee Warbler, Northern Parula, Chestnut-sided Warbler, Blackburnian Warbler, Black-and-white Warbler, Mournig Warbler, Rufous-capped Warbler, Bananaquit, Hepatic Tanager, Summer Tanager, Cherrie's Tanager, Blue-gray Panager, Palm Tanager, Silver-throated Tanager, Bay-headed Tanager, Golden-hooded Tanager, Scarlet-thighed Dacnis, Blue Dacnis, Green Honeycreeper, Shining Honeycreeper, Red-legged Honeycreeper, Variable Seedeater, Yellow-faced Grassquit, Black-striped Sparrow, Streaked Saltator, Buff-throated Saltator, Rose-breasted Grosbeak, Great-tailed Grackle, Crested Oropendola, Yellow-throated Euphonia, Spot-crowned Euphonia, Lesser Goldfinch, Violet Crowned Woodnymph, Scaly Breasted Hummingbird, Charming Hummingbird, Scaly Crested Pygmy Tyrant, Buff Rumped Warbler, White Ruffed Manakin. We moved to this area in 2006 from the mountains of Western Colorado and now share it with our four dogs and one cat, as well as a myriad of resident birds. We spend time gardening, socializing with other gringos in the area, hiking, biking and beach combing and boogie boarding at nearby Playa la Barqueta (and, of course, feeding the birds). We purchased in this location because of it's proximity to outdoor activities here in Cuesta de Piedra as well as the nearby rainforests and beaches. It's a temperate climate that is warm during the day and cool enough to need a light blanket for sleeping at night. We do not receive the strong winds that affect both Volcan and Boquete during our Summer months. We are fortunate to have mostly cows for neighbors and incredible bird watching almost every day. Our Panamanian neighbors are friendly and this area is clean and well maintained. The water is potable from the faucet and there is plenty of it. We are surrounded by dairy farms and small residences, this is a very rural setting. Volcan Baru, Panama's highest point (11,400 feet tall) is viewed from this property. Air conditioning not required, fans provided if needed. Many private areas for birdwatching. Great little place to stay. comfortabke and well equipped. Loved our time at Birders Paradise. The Longbons are great host. The home is more spacious then the pictures portray and the surrounding property beautifully landscaped. I had to push myself to leave the property to explore, more spcefically the back deck. I could have spent my entire time taking in the view and spotting and identifying birds. But we did take several trips to Volcan and Cerro Punta. We hired a guide from Eco Tours to see the Quetzals and saw several, I highly recommend. We also enjoyed eating dinner at Fannies in Volcan. There’s also a great little wine and coffee shop in Volcan, I think it’s call Black Mountain Coffee Roasters they also serve lunch. I hope I can come back and stay longer. "Birders' Paradise" was indeed just that! As birders, we couldn't have been more pleased. Our hosts, Jerry and Lynn, have feeders that attract many different species. 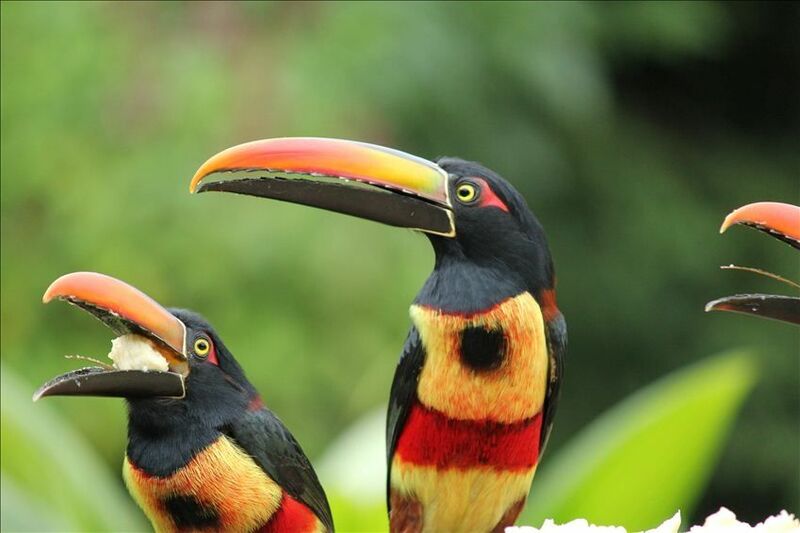 You'll love when the Fiery-billed Aracaris arrive, the Crested Oropendolas and Motmots. The Crested Guan was a regular on the property as well as numerous tanagers, flycatchers and hummingbirds. We enjoyed a spectacular show by the Swallow-tailed Kites... swooping above us carrying nesting material as breeding season was well underway. The location itself is very appealing- a short walk to Macho de Monte Canyon and close to Volcan for all the amenities it offers including some very good restaurants. The apartment was very comfortable, downstairs and upstairs ( staircase required). The balcony upstairs offered a great spot for meals, birdwatching and enjoying the beautiful surrounding vista. Our hosts, Lynn and Jerry, were very generous and accommodating and we enjoyed our stay with them immensely. This property exceeded our expectations in every way. Friendly and accommodating hosts, gorgeous grounds and views, comfortable beds and places to sit, fully equipped kitchen. Very clean and neat and safe. Birds galore and 3 sweet dogs to greet us every day. Felt like home! Definitely a place for birders! It was perfect with some easy birding. Start on the balcony with your breakfast and get the first parrots, aracari and tanagers on your list, afterwards you can just take a walk in the garden and see more than 40 species of birds in a couple of hours. Best part the birding seems to be even better late afternoon/evening. If you want more you can visit the nearby Birders Paradise in Paraíso, here we had more than 100 species of birds in one morning. The house is very luxurious, WiFi is working very well, lots of hot water and a very big kitchen. Be sure to bring food as there is not much to get close by. We would definitely like to come back. P.S. Congratulations on the Red Sox win in the World Series! The owners were incredibly likeable & iwere gracious hosts. Apartment and grounds were beyond our expectations as was the birding! From David airport: exit left from airport and go 3.4 km, turn left at the stop light and drive past McDonalds to the next stop light where you will turn left onto the Pan-American highway. Stay on this road for about 21 km to the town of Concepcion where you will turn right onto the Via Volcan. Look for the green sign indicating 'Volcan'. Drive another 20km to Cuesta de Piedra and turn right. Just before you get to the turn for Cuesta de Piedra the road will curve to the left and you will see a church on a hill surrounded by radio towers straight ahead. You will pass some very brightly colored houses on your right and there will be a road that t's off to the right. Turn there and go until just past the 2K marker on the right side of the road, our house is entered at the drive just past this marker, turning to your left. There will be a large black iron gate and a sign 'Residencia Longbons'. You're there! Coming from Boquete you will drive towards David and turn right at the Terpel gas station onto the new road to Volcan. Follow the signs to Cuesta de Piedra and notice that there are kilometer markers along the side of the road. Our place is located on the right just before the 2 kilometer marker. You'll see a cream colored column and that marks our driveway. It's a sharp turn coming from that direction so you'll need to swing wide to make the turn. Honk or use the intercom and we'll open the gate. Rates are based on 2 person occupancy. Add $15 for each add'l. adult, max. occupancy is 4.